Last time I wrote about these things was december 18 after I read a new article published by NOAA in the U.S. It showed that the sealevelrise were not so high. Maybe even these 3 mm/år measured during the 80´s and 90´s are the result of the method of measurement when they only used altimetry and not as the article showed that altimetry combined with measurements of ocean mass and Argo floats that measure ocean temperature gives a netter measurement. The program from Science Radio Sweden interviewed some IPCC scientists who point out that in the early 1900's it was a slightly larger sea level rise than in the middle, but we had no great CO2 emissions. They also point out that there are natural variations and the relationship between the greenhouse effect and sea level rise is not so clear. Lennart Bengtsson also interviewed emphasizes that there is no acceleration in the sea level rise. In the leaked report/draft of the IPCC, I discovered that Valentina Radic and Regine Hock are involved as co-author. It was these scholars who, having added approximately 120,000 glaciers in the models arrived at a probable sea level rise of 10-12 cm from the glacier melt by 2100. 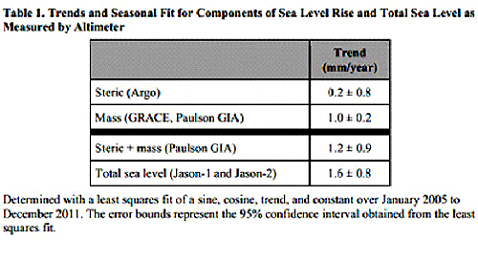 In this paper, you will find the following table of sea level rise. Nice to see that the doomsayers get some public resistance.